Private University Students Association of Ghana (PUSAG) has called for the dismissal of the Deputy Educational Minister, Samuel Okudzeto Ablakwa, over what they claim to be gross incompetence and lack of interest in the affairs of private universities and their students across the country. 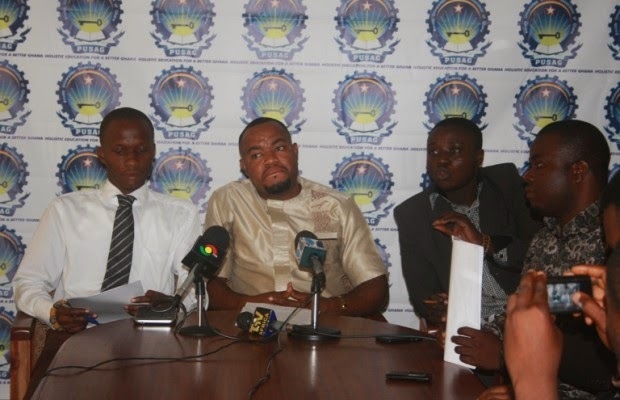 PUSAG executives at a media briefing on Tuesday pointed out that Mr Ablakwa had his priorities misplaced with regard to running the affairs of tertiary institutions in Ghana. They, therefore, called on President John Mahama to “immediately remove Ablakwa from office” for embarking on the Campus Connect Series, which they termed as “a fruitless venture at the expense of the taxpayer” or they would be inimical to the electoral fortunes of the NDC government in 2016. The Campus Connect Series is a programme which was rolled out by the Tertiary Education Division of the Ministry of Education under the leadership of Okudzeto Ablakwa that would see ministers of state as well as other government officials visit tertiary institutions across the country to interact and connect with students. According to PUSAG President, Mohammed Adam Sukparu, the association was dissociating itself from the entire programme because it is an absolute waste of time and energy for Ablakwa and his outfit to spend huge amount of money on such a programme. “As we speak now, the nation’s education sector is overwhelmed with several seemingly intractable challenges which ought to be the preoccupation of Ablakwa and not this so-called Campus Connect Series which we see as a deliberate attempt and a clandestine move to woo students into coming to terms with government propaganda message ahead of the elections 2016,” PUSAG President stated. Mohammed Adam Sukparu disclosed that since his appointment, Ablakwa has treated matters pertaining to PUSAG with absolute disdain. “For that matter, we also do not need him and his team in our schools and we are accordingly directing all SRCs in private universities not to cooperate with the so-called Ablakwa’s campus connect team should they make any attempt to visit them,” Mohammed Sukparu added. The association mentioned that it was dealing with government’s decision to slap a needless 25 percent corporate tax on private universities which they claimed is very unpopular because of the rippling effects it would have on students. “If Ablakwa pretends that he and his government are unaware of our problems, then we wish to remind them as we always do; even though we doubt very much that they would make any attempt to address our issues. In as much as we are not calling for parity with respect to how government treats our counterparts in the public universities, we nonetheless think that as Ghanaian taxpayers and in the letter and spirit of our national constitution which enjoins us to see education as a due right and not a privilege, government must consider some of its actions and policies which do not augur well for the educational well-being of students in private universities,” he said.